Here are a few of the projects I’ve had my eye on. This adorable game is brought to you by Game Salute. Monsters & Maidens is a risk-taking dice-centric game where you “rescue” maidens. You roll three sets of dice (three each for nine total) and pair off maidens, heroes, and monsters. Heroes cancel out monsters, monsters kidnap maidens. Any maidens not kidnapped by monsters are added to your score. Left-over dice can be re-rolled in the hopes of rescuing more maidens, but monster-filled rolls could pull back maidens from your active pool. So it’s not just a game of dice rolls, but of strategy. The current unlocked “stretch goals” for this project are the “meeples” and a female hero card. At $10,000 they’ll expand the gameplay. Price Points: This one’s real easy, with only two tiers: $15 for a standard edition of the game and $25 for the “deluxe edition,” which comes with sixty “meeples” for counting your maidens. The funding period ends on November 8th, so get in your pledges soon to get a copy of the game! Shadows of Brimstone (from Flying Frog Productions) is described as a “fast-paced, cooperative, dungeon-crawl boardgame set in the Old West, and mixed with Unspeakable Horror!” I mean, if that line doesn’t get you, you’re visiting the wrong website. The game features a vast array of miniatures, ranging from western archetype heroes to horror-inspired monsters and baddies. I’m super into anything that involves mini’s, but with a concept like this I’m even more involved. There are two core sets of the game, dubbed “City of the Ancients” and “Swamps of Death.” Each core set includes four sweet hero figures, a large quantity of well-designed monster minis, rearrange-able map tiles, dice, and a CD soundtrack, among the other required gaming materials. Price Points: As almost any Kickstarter involving minis, there are a variety of tiers, and they do get pricey. $75 gets you one core set plus an art book and an 8′ x 10′ print. At $150, you get both sets and automatically receive the vast stretch goals that have been unlocked, which range from variant figures to additional card content for the game. Above that the tiers are mostly sold out, but there are a few high-priced levels available that involve getting every piece of add-on content, lunch with the game creators, a tour of the Flying Frog studios, or even becoming the basis for a playable character in a future expansion. The funding period ends on November 24th. The game already has over 2,100 backers, so it’s well funded at this point. RARRR!!! 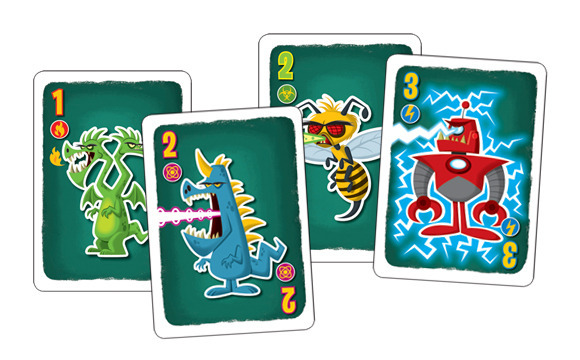 by APE Games is a card game where players build monsters (or kaiju) using monster, name, and power cards. Then they unleash their creations upon cities and destroy them, which is how the score is totaled. A tutorial is also on the game’s Kickstarter page, so you can learn the rules before you pledge your cash! Vibrant and fun, these creatures run through the gamut of old Japanese monster movies. Giant bee, two-headed dragon, evil robot… just look below at some of them! Price Points: Outside of two high-end tiers with custom monster and city rewards, the RARRR!!! pledge levels are very affordable. $20 nabs you a copy of the game (tier due to ship in April 2014) but for an extra $1 you receive two copies of the game and every stretch goal that’s been unlocked. Right now that includes papercraft monsters and a city, and now bonus monster cards are being unlocked as well. The funding period ends on November 25th. This is exactly what it sounds like. 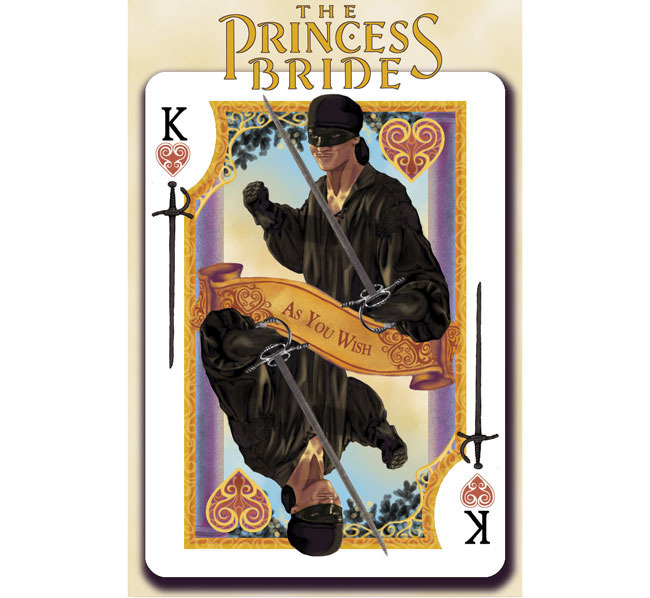 Officially licensed Princess Bride playing cards with gorgeous artwork. There will be at least three unique decks (all have been unlocked as part of the “stretch goals”), one with a realistic painted style and another that’s an animated take on the movie’s scenes. The third’s artwork has yet to be revealed. But it’s Princess Bride Merchandise. Fans should just want this. The creating company Albino Dragon has a respectable track record of Kickstarters with Cthulhu, White Rabbit, and “The Name of the Wind” decks all funded over the past year. The funding period ends on November 26th. And there you have it! The first edition of Mostly Average Joe’s Kickstarter Kabinet! Be on the lookout for any future projects you think we should feature and send them our way! Game on friends!